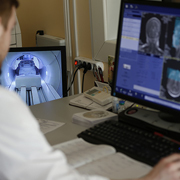 A radiology information system (RIS) is a networked software system useful, to track the imaging orders and view the billing information, and is often used in conjunction with PACS and VNAs to manage image archives, record-keeping and billing. The measurable effects of implementing an RIS are highly encouraging: more accurate diagnosis, less medical errors, and improved coordination of care across service boundaries. An RIS integrates multiple functions into one comprehensive system, thereby eliminating redundancies while increasing efficiency and accessibility. Our team of highly experienced radiologists uses radiology information systems to help your staff make appointments for both inpatients and outpatients. Using an RIS, our team at Outsource2india is able to track the complete patient workflow within the department. We can also add reports and images obtained from different modalities which can later be accessed by authorized radiology staff. Using the radiology information system, our expert team of radiologists can track a patient's entire radiology history right from the time of admission to the day of discharged and also track all the appointments at one place. Using an RIS, we can generate statistical reports for a single patient, group of patients, or particular procedures. We generally use RIS to track individual films and their associated data. But with EHR becoming the standard across the healthcare industry and PACS being widely accepted, our RIS-PACS systems have been more drawn into the clinical workflow of the entire medical enterprise. Though the functions such as processing of electronic payments and claims and record keeping are becoming a part of the medical organization's overall electronic health record systems, we provide these services with the help of radiology information systems. In order to ensure that your workflow is always considered as the topmost priority and the efficiency is always high, the service-oriented architecture of the RIS provides flexible and reliable workflow optimization services. The local configurations are taken care by the easy-to-use toolkit provided. With our radiology information system it is easy to migrate to ICD-10 with the dual ICD-9 and ICD-10 code sets available. Ensure secure and effective communication with patients via the RIS portal, providing access to imaging reports, scheduling and secure messaging. The RIS can quickly and easily deliver complete reports and patient data to your referring physician's network and into your referring physician's EHR. Maximize efficiency through configurable work queues that enable tasks to be assigned to users based on role, job function, specialty, availability or other criteria. Optimize ambulatory radiology practice capacity and capture incremental revenue opportunities with flexible and detailed scheduling options. RIS is tightly integrated with our PACS imaging system, our billing system and complemented by modules supporting referring physicians, business intelligence/dashboards, document management and more. 100% web-based architecture makes it easy for small practices to deploy and manage, while native architecture allows for scalability without sacrificing speed or performance. Collaborate and network with an empowered and energized group of customers who provide thoughtful feedback and actively engage in the development process. What Are the Benefits of RIS? Without effective radiology information systems, no service provider can know everything regarding the patient. Storing all the information in an RIS reduces such fragmentation and creates smoother transitions between various settings. An RIS offers an immediate and complete overview of a patient's medical history. This allows the clinician to accurately diagnose the condition sooner, reduce medication conflicts and reduce errors. In addition, the system alerts clinicians to the patient's conditions and allergies that could be life-threatening. An RIS provides instant, complete access to patient records, real-time reporting, complete documentation tools, interfacing with other providers and enhanced decision support. Patients experience reliable reminders and point-of-care information, less paperwork, electronic referrals and follow-ups, and electronic submission of prescriptions to the pharmacy. An RIS links aspects of care that were previously separate: patient appointments and charts, communication with other providers and medical billing. This leads to accurate coding, improved delivery of care, and increased revenue and productivity. With multiple levels of integration, including integration with PACS and diagnostic reporting, the RIS streamlines radiology workflows and is designed to be modular and scalable, allowing its functionality to grow with your organization. The administrative tool set includes features that seamlessly handle manual and automatic scheduling of procedures and also handle patient tracking with time stamps for metrics. All the patient documents, past histories, etc. visible on single screen through which the RIS lets radiologists invest less time seeking the patient data required during the patient examination. Why Choose Outsource2india for Radiology Information System Services? Outsource2india has been providing healthcare BPO services to clients around the globe for over 20 years now. Our RIS services are integrated to the PACS systems and support patient-centric workflow management that dissolves departmental boundaries for your entire enterprise. Our solutions can give patients the best possible care, be it weekdays, weekends at any possible hour of the day. We also provide other services such as 3D image processing, nighthawk teleradiology, medical imaging, and several more. If you have any kind or radiology information system requirement, feel free to call us or write to us and we will happy to help you.